Guru Dutt was a man of many talents – he was an actor, director, writer and choreographer. His films Kaagaz Ke Phool, Pyaasa and Saahib, Bibi Aur Ghulam are classic studies of unrequited love, angst and pain. They carry social messages and have been subjects of study for budding filmmakers to this day. Vasanthkumar Shivashankar Padukone, later famous as Guru Dutt, was born in a traditional Gaur Saraswat Brahmin household in the village of Panambur, South Karnataka. His father Shivashankar was a schoolteacher who later took up a bank job in Bangalore. 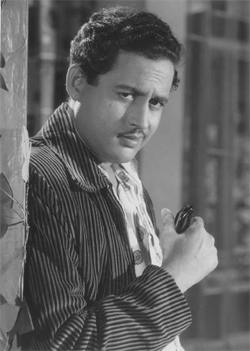 The young Vasanthkumar was renamed Guru Dutt after a near fatal childhood accident. Childhood for Guru Dutt was an unhappy one due to a strained marital relationship between his parents. The family moved to Kolkata where his father was employed with Burmah Shell. Guru Dutt gave up schooling due to the family’s financial difficulties. He won an annual scholarship of Rs 75 and studied dance and drama at Almora under the aegis of the Uday Shankar India Culture Centre in 1941-1944. He then moved to Pune where he joined the Prabhat Film Company. Guru Dutt spent most of his formative years in Kolkata and spoke fluent Bengali. He identified with Bengali culture to the extent that he dropped the Padukone from his name, retaining only Guru Dutt since it sounded like a Bengali name. Guru Dutt made his acting debut in the film Chand (1944). He functioned in the capacity of an assistant director and as a choreographer for the next three years. In 1947, Guru Dutt joined Baburao Pai, the owner of the Prabhat Film Company, as his personal assistant. It was during this stint that he wrote the script for Pyaasa. Guru Dutt also formed an enduring friendship with Dev Anand, who offered Guru Dutt a chance of directing Baazi. The success of Baazi was followed by failures of Jaal and Baaz under the Navetan banner, soon followed by the box office success of CID. Luckily, Guru Dutt found success as a leading man and director in his next three films: Aar Paar (1954), Mr and Mrs 55 (1955) and Pyaasa (1957). Guru Dutt suffered from depression after his 1959 film Kaagaz Ke Phool flopped at the box office. He had invested heavily in the movie and faced financial ruin. Luckily, the box office success of Saahib Bibi Aur Ghulam and Chaudvin Ka Chaand bought him out of near penury. Guru Dutt married playback singer Geeta Mukherjee in 1953. Their marriage was a troubled one due to Guru Dutt’s heavy drinking and rumoured liaison with his leading lady, Waheeda Rahman. By 1964, he was plagued by insomnia and alcoholism. With financial losses and being alienated from his family and paramour, he often took sleeping pills to help him sleep. It was this deadly combination of sleeping pills and alcohol which caused his death on 10th October 1964. Guru Dutt pioneered the use of the 100 mm lens to take close up shots- which came to be termed the Guru Dutt shot. His list of protégées includes Zohra Sehgal, Johnny Walker and Waheeda Rahman. His films are considered classics due to the sharp editing, beautiful composition of shots and the memorable characters in the plot.